Do you like lingering over a cup of coffee while reading the newspaper or chatting with friends? 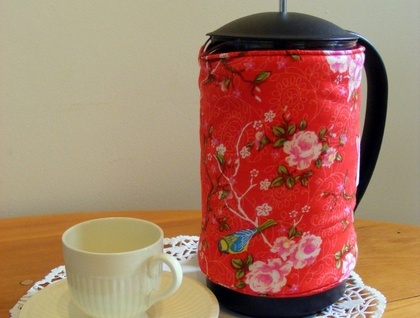 Don't let the coffee get cold - use a pretty coffee cosy to keep your plunger warm. Great for breakfast, or after dinner when you're too full to get up to make more hot coffee! This cosy fits the 6-8 cup sized plunger (or French Press if thats what you know it as) and is lined with insulated batting. Contact sweetdesigns to enquire about payment or shipping options.